Building sustainable energy infrastructure provides a triple win: it boosts growth, reduces air pollution and greenhouse gas emissions, and expands and improves energy access. It helps avoid the risks of high-carbon assets, and plays a key role in building resilience and overcoming poverty. Yet a great deal of unsustainable infrastructure continues to be built. Worldwide, the equivalent of 1,500 coal plants are estimated to be in construction or are planned.2 The public sector accounts for more than half of investment in coal-fired power.3 And the risk of stranding is significant: globally, an estimated US$1.1 trillion of current energy-sector assets, particularly coal mines, may be stranded in the transition to a low-carbon economy.4 From a human health and environmental perspective, there may be an even greater risk if the power plants continue to go ahead, namely, that the political economy around vested interests could lock in business-as-usual energy production, even where it is economically suboptimal. 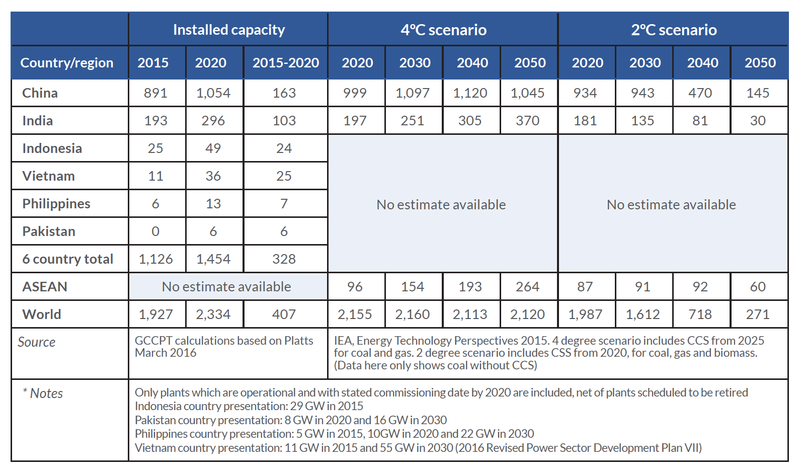 More than 80% of the new coal power plants due to start operation between 2015 and 2020 are in just six Asian countries: China, India, Vietnam, Indonesia, the Philippines and Pakistan (see Table 3). China and India are expected to together account for two-thirds of new global capacity to 2020. If all these plants are built, they would lock in over their lifetimes a significant share of the global carbon budget that the world cannot exceed if it is to reliably meet the 2°C goal5 and would surpass the International Energy Agency’s (IEA) projected sector capacity constraints for fossil fuel power generation (see Table 3). Replacing fossil fuel energy sources and building new clean energy systems on a large scale requires system-level innovation, including new technologies for energy efficiency and demand-side management. We need not only renewable energy capacity, but also ways to manage the intermittency of wind and solar PV generation, including energy storage and “smart grid” infrastructure. The sustainable energy infrastructure required will vary by country and shift over time, but overall, transformative investments are needed in off-grid, distributed clean energy systems; storage, transmission and distribution systems for on-grid renewable energy; and information technologies that support efficiency and flexibility in system management. Shifting to a sustainable energy system can create a virtuous cycle of low-carbon, climate-resilient growth across a broad range of sectors.11 The first step is to adopt policies to shift investments away from fossil fuels and high-carbon technologies and towards clean energy and energy efficiency. This, in turn, reduces the costs associated with fossil fuels. For example, in the US, coal transportation accounted for 38.8% of total freight tonnage in 2014.12 Implementation of low-carbon growth policies, in the US and globally, would reduce the need for coal transportation, and promote a shift of higher-value freight from road to rail. The reduced need to extract, process and distribute fossil fuels – and to build and maintain related infrastructure – would also yield significant savings that can be invested in supporting low-carbon growth. A key recommendation of the Global Commission’s 2015 report was to scale up commitments by development banks working with governments and the private sector to invest at least US$1 trillion per year by 2030 in clean energy, including energy efficiency.13 Ensuring access to modern energy services is also critical for developing countries, yet recent analysis suggests that development finance is not yet targeting key outcomes such as decentralized energy access.14 Three energy-related goals – on renewable energy, energy efficiency and clean energy access – are embodied in SDG 7 (“ensure access to affordable, reliable, sustainable and modern energy for all”) and championed in the UN Secretary-General’s Sustainable Energy For All initiative (SE4All).15 Energy infrastructure investment needs to reflect these three priorities, tailored to local circumstances. There is enough capital in the world to meet sustainable energy infrastructure requirements. The challenge is to ensure that the right conditions – including well-functioning energy markets – are in place to attract it, both domestically and internationally.16 In this section we focus on three core action areas: fundamental price distortions, the lack of investment frameworks, capacities and policies for incentivising sustainable infrastructure, and the need for investment in clean technology and deployment to reduce upfront investment costs. There are a number of barriers and market failures that drive the gap between potential and current uptake for investment in energy efficiency. One is misaligned incentives, such as the “tenant-landlord” problem, where the landlord might pay for efficiency improvements, but the tenant reaps the benefits of lower energy bills. Others include the lack of upfront capital by relevant parties (e.g. households and small businesses); the complexity, risk and uncertainty associated with these measures; a lack of awareness of the benefits they can deliver; and potential “hidden costs”, such as the effort required to research and install energy efficiency measures. Financing for energy efficiency may also not be happening at the scale needed due to difficulties in capturing the financial value of investments. Instead of new revenue, these investments generate savings, and unlike new revenue, the savings often cannot be directly measured or isolated. Moreover, most energy efficiency loans are tied to the creditworthiness of the building owner, meaning financiers have to vet each building owner individually. This increases transaction costs and reduces the supply of external finance. Many energy efficiency investments are not purely for energy efficiency, but are integrated into more general investments, such as in the construction or refurbishment of buildings and facilities. Accordingly, a large portion of energy efficiency investments are made by building owners (households or businesses) from their own resources, not from external financial investors. Energy efficiency finance is seeing significant innovation. Financing models have been developed to cater better to the wide diversity of projects and to overcome the range of contextual hurdles they face in different countries. As highlighted in Box 21 below, the EBRD has made particular progress as a development finance institution in providing finance for energy efficiency improvements. Specialised energy efficiency entities, such as energy service companies (ESCOs), could play an increasingly important role in many countries in implementing these models. There are also a number of high-level initiatives promoting investment by mobilising financial institutions. For instance, the SE4All initiative aims to double the global rate of improvement in energy efficiency by 2030. Fundamental price distortions are holding back the transformation of energy markets worldwide. Removing these distortions would level the playing field and remove many barriers to investment in clean energy infrastructure and in continued innovation. It would also incentivise greater energy efficiency and promote sustainability in energy systems. If countries are to invest in least-cost energy pathways, their planning processes need to account for the full range of costs and benefits of different options. Yet many energy system plans are based on outdated prices for renewable and energy efficiency technologies. They also reflect incomplete assessments of the local costs and benefits, as well as existing price distortions. As a result, many energy system investment plans still prioritise fossil fuels over clean energy. The economic costs associated with the health impacts of air pollution are also significant. Analysis for the Global Commission shows that the health and mortality burden of air pollution can be considerable, amounting to as much as 4% or more of GDP in some countries.27 Recent analysis by the OECD28 has found that globally, if we continue with business as usual, air pollution-related healthcare costs alone are projected to increase from US$21 billion in 2015 (using constant 2010 US$ and PPP exchange rates) to US$176 billion in 2060. By 2060, the annual number of lost working days, which affect labour productivity, are projected to reach 3.7 billion (from around 1.2 billion today) at the global level. The annual global welfare costs associated with premature deaths from outdoor air pollution are projected to rise from US$3 trillion in 2015 to US$18-25 trillion in 2060. In addition, the annual global welfare costs associated with pain and suffering from illness are projected to be around US$2.2 trillion by 2060, up from around US$300 billion in 2015.29 Thus, welfare costs of air pollution that are in the range of a few trillion dollars today are expected to be an order of magnitude higher by 2060, unless we make a major shift in the way we use energy and control air pollution. Considering the indirect costs of air pollution raises the costs even more: roughly doubling the costs of air pollution in the near-term and adding another order of magnitude of costs in the longer term due to a slowdown of economic growth. Analysis by the IMF on the damages and costs caused by fossil fuels – through impacts such as air pollution, congestion, traffic accidents and climate change – shows that coal has the largest negative impact on human health through the pollution that it causes, and yet coal’s use is pervasively undercharged in terms of fuel taxes and carbon pricing. Along with air pollution and CO2 emissions, the damages from the full life cycle of coal include land disturbance, fatalities in extraction and transport and methane and mercury emissions. Factoring all this into estimates of the cost of coal can double or triple its price; for example, in cost estimates based on coal from the Appalachia, in the US these costs add close to US$0.18 per kWh. This makes wind, solar and other forms of non-fossil fuel power generation, along with investments in energy efficiency, economically competitive. While there are limitations to these estimates, it is clear that air pollution imposes a very serious cost on society, and it must be duly accounted for in economic assessments to avoid making irresponsible investment choices.33 The benefits of reducing air pollution can also be enjoyed in the near term, and accrue locally, mostly to the benefit of the country taking action. Governments should incorporate these cost estimates into the analyses that guide public investment decisions. Regulatory or price-based policies can ensure that the private sector does the same. Fossil fuel subsidies amounted to approximately US$550 billion in 2014. This includes the under-pricing of fuels in many emerging and developing economies amounting to around US$493 billion34 and other forms of support for the exploration, production and consumption of fossil fuels in OECD countries and key emerging economies amounting to more than US$60 billion.35 These amounts represent a reduction from previous years, partly reflecting recent progress in subsidy reform made by a number of countries and partly due to continuing low oil prices. In the last three years, 28 countries have launched or stepped up their efforts to reform fossil fuel subsidies. Reform efforts have gained momentum through international forums such as the G7 and the G20 as well as through Asia-Pacific Economic Cooperation (APEC), with support from leading international organisations such as the OECD, the World Bank, the IEA, the IMF and the Organization of the Petroleum Exporting Countries (OPEC). G7 and G20 members have made commitments to rationalise and phase out “inefficient” fossil fuel subsidies over the medium term. In May 2016, the G7 countries and the EU reiterated their commitment and for the first time set a deadline, encouraging all countries to phase out these subsidies by 2025.37 North American leaders also committed to a phase-out by 2025 when they met in June 2016. The Commission calls on the G20 to also adopt a clear deadline for the phase-out of fossil fuel subsidies. Many countries have started to voluntarily report subsidies they deem inefficient.38 Some G20 members have agreed to undertake reciprocal peer reviews of their subsidies and progress on reform. China and the US volunteered to go first, and the reports were delivered to the September 2016 G20 Summit. The next rounds will involve Germany, Mexico and Indonesia.39 A similar peer review process has commenced in APEC, starting with Peru in 2014, and continuing with New Zealand in 2015 and the Philippines in 2016. Low oil prices have provided an important opportunity for oil-importing countries to reform consumer subsidies without raising prices for consumers. Indonesia and India, for instance, have taken advantage of low oil prices to accelerate their reforms. Subsidies to energy and fuel often particularly benefit middle- and high-income households – an IMF review of fossil fuel subsidies in developing countries, for example, found that on average only 3% of gasoline and 7% of diesel fuel subsidies reach the poorest 20% of households,40and the richest 20% of households capture, on average, more than six times more in fuel subsidies than the poorest 20%.41 As such, reforms can be progressive and the savings can be channelled into investments that more directly benefit the poorest and most vulnerable in society, for example through better targeted income support and social safety nets and through investments in pro-poor infrastructure such as off-grid renewable energy solutions and energy efficiency. Saudi Arabia raised fuel prices by 66% in 2016 as part of a wider subsidy reform process. For the market to reflect the full costs of GHG emissions from burning of fossil fuels, countries should introduce meaningful and rising carbon prices in tandem with subsidy reform.57 As noted in Section 2, around 40 countries and 20 cities, states and regions, have implemented or scheduled an explicit price on carbon, covering an estimated 7 Gt CO2e, or about 13% of annual global greenhouse gas emissions.58 This is triple the coverage of a decade ago. However, carbon prices are generally too low: less than US$10 per tonne CO2e for about three quarters of covered emissions.63 This is not enough to bring about transformative change. Still, the Paris Agreement has shifted expectations. A recent survey of members of the International Emissions Trading Association (IETA) found that 82% of respondents expect carbon markets to grow because of the Agreement.64 They also suggested that achieving the Paris goals would require a carbon price of US$45. Through the Carbon Pricing Leadership Coalition (CPLC), meanwhile, governments, industry leaders and international organisations are working together to increase knowledge on how to design and implement successful carbon pricing systems.65 As part of this effort, the World Bank, the OECD and the IMF have developed a set of principles for successful carbon pricing, based on lessons from carbon pricing experiences around the world. The CPLC is supported by a Carbon Pricing Panel, made up of sitting leaders of countries that have already taken action on carbon pricing and are personally advocating for other leaders to follow.66 Given the critical importance of doing away with perverse subsidies and pricing carbon properly, the Global Commission welcomes the emerging coalitions of governments, investors and businesses – including through the CPLC and the G20 – that have the potential to accelerate action globally on fossil fuel subsidy reform and carbon pricing, including by highlighting evidence of good practice and building multi-stakeholder partnerships for reform. Beyond carbon taxes and emissions trading, another way that countries are pricing carbon is through fuel taxes more broadly, in particular transport taxes, which are generally already widely accepted.67 For example, Vietnam adjusted taxes, including on transport fuels, to better reflect carbon content, and thereby boosted investment and domestic demand for goods and services.68 Transport fuel taxes, however, may reflect a range of externalities beyond climate change, including congestion, road damage and local air pollution. A tax that reflects all of this will be higher per unit of fuel than if only taxing carbon content. However, current transport and energy taxes generally do not reflect the full social costs of the use of these fuels. Recent analysis shows that OECD countries inconsistently tax different forms, uses and users of energy relative to environmental and other social costs.69 Of particular note is that there is often a very low or zero tax rate on coal, despite its greater contribution than other fuels to GHG emissions and air pollution per unit of energy. In all but the US, the tax on diesel in OECD countries is lower than the tax on petrol, despite diesel’s much higher air pollution impacts (see also Box 24 in Section 5). Adjusting fuel taxes is a low-cost opportunity for reforms to ensure, where possible, that tax rates reflect the external costs associated with different forms of energy and energy use. This includes planning, public investment management and policies to improve the enabling environment for private investment in sustainable energy infrastructure. Countries need to articulate a clear and comprehensive national strategy for sustainable energy and related infrastructure, and embed it in an overall policy strategy for sustainable and inclusive growth and development. Such planning is particularly important in developing countries, where national development plans are used to guide development cooperation and the allocation of official development assistance (ODA). A key part of this is aligning national investment and climate policies, and enhancing the coherence and predictability of policies that affect broader investment frameworks. Ideally, a single integrated strategy for low-carbon, sustainable development should map to sector plans, national and subnational planning to guide investment. Importantly, this also helps prepare a project pipeline and incentivise private investment in clean energy infrastructure. The development of dedicated energy transition plans can dramatically accelerate the shift to a clean energy mix, in a way that delivers clean and resilient energy access. The Global Commission calls on all countries to develop transition plans to accelerate a scale-up of clean and resilient energy solutions and a phase-out of coal, in a way that delivers on energy access goals and facilitates a “just transition” for workers. The Global Commission welcomes the establishment of a Just Transition Centre that is initiated by the International Trade Union Confederation (ITUC) with emerging partnerships with business and civil society, focused on dialogue between governments, employers, workers and civil society around how to ensure a “just transition” towards including at national and sectoral levels. A comprehensive domestic investment policy framework needs to cover the full range of policy fields that are critical for creating an enabling environment for clean energy investment, including investment promotion and facilitation, trade, competition and tax policy; corporate governance, policies for enabling responsible business conduct and public governance; and issues relevant to finance and financial markets policy.71 Ensuring that such a framework leads to green investment requires specific policies and measures. In particular, environmental considerations must be appropriately integrated into investment decisions, for instance by agreeing on and applying a standard for assessing the life-cycle emissions and climate vulnerability of energy infrastructure investments to ensure they align with long-term climate goals. The culture and incentives for financiers has started to change but will need to go further to prioritise and value more sustainable long-term investments over a narrow focus on short-term gains. The OECD has proposed a non-prescriptive checklist for clean energy investment policy frameworks, with the aim to strengthen investor protection and transparency, avoid discrimination, ensure stable and predictable incentives and avoid policy uncertainty, strengthen competition policy and electricity market design, and enhance public governance of energy systems.72 Policy reforms will also be required to create incentives for new business models to emerge, for example for integration of centralised and decentralised energy, wireless platforms for customer services and payments, and connecting utilities functions with small and medium size enterprises to provide energy services including energy efficiency. Building such institutional capacity and setting in motion relevant policy reform processes has a cost, takes time and cannot succeed without high level commitment and leadership from the government. It likely entails staff training, data collection and analysis, changing legislation and regulations, and capacity for enforcement. In developing countries, external support can play a pivotal role to help deliver enabling policy reforms and to strengthen capacity to finance sustainable infrastructure. For example, ODA, particularly where it can be programmed in across multiple years to ensure continuity, can help to fill the financing gap in this area for poorer developing countries. Meeting large sustainable energy infrastructure needs will require determined efforts to tap any available scope for additional domestic resource mobilisation through tax and expenditure policies. It will also require better use of government balance sheets. Given the significant potential for private investment in the clean energy space, a key focus of public-sector investment should be to catalyse private finance – and to fill gaps where the private sector is unlikely to step in. Tax revenues relative to GDP are much lower in emerging and developing economies than in advanced economies, so there may be considerable scope for greater revenue mobilisation through tax reform and tighter tax administration. Improved taxation has many benefits, including establishing a revenue base for further investment and strengthening the public balance sheet. As part of public investment management, it is in governments’ self-interest to improve procurement principles and practices, and devise means to integrate sustainability parameters, particularly at the sector level in the case of energy (see Box 20 for examples). The agency conducted a thorough market analysis, including a consultation through online surveys addressed to businesses and the main trade associations in Italy. Suppliers were invited to provide input on Consip’s planned approach. The result was a framework contract, open to all public administrations, that includes improved energy efficiency, consumption reduction and CO2 emissions avoidance. The idea was to motivate suppliers to optimise energy consumption and resource management to improve their profitability. The initiative saved public administrations 27% on contracts worth about €800 million (US$880 million), covering about 6,000 buildings. Another example is South Africa’s Renewable Energy Independent Power Producer Procurement Programme (REIPPPP), which replaced feed-in tariffs for renewable energy.80 The REIPPPP has successfully channelled substantial private-sector expertise and investment into grid-connected renewable energy in South Africa at competitive prices. The first three bid rounds, held over 2.5 years, attracted a wide variety of domestic and international project developers, sponsors and equity shareholders. A total of 64 projects have been awarded to the private sector, with more than 100 entities participating in the contracts. Banks, insurers, DFIs and even international utilities are involved. Notably, 86% of the debt finance has been raised within South Africa. The first projects are already operating, and investments totalling US$14 billion have been committed, to generate nearly 4 GW of renewable power. Over the three rounds, average solar PV tariffs decreased by 68%, and wind by 42%, in nominal terms. REIPPPP demonstrates that private sponsors and financiers are more than willing to invest in renewable energy if the procurement process is well-designed and transparent, transactions have reasonable levels of profitability, and key risks (programme design, programme management and market risks) are mitigated. REIPPPP also highlights the need for effective programme champions with the credibility to interact convincingly with senior government officials, effectively explain the program to stakeholders, and communicate and negotiate with the private sector. There is an increasing recognition of the role that local financial institutions (LFIs) play in promoting private investment in sustainable infrastructure, including energy efficiency. These can be commercial or public entities; for the latter, a key role is to catalyse engagement with commercial banks. These barriers can be addressed by building internal knowledge, awareness and capacity within local banks; fostering changes in their internal culture; sharing knowledge among LFIs; and appropriately accounting for, documenting and pricing the benefits of green investments. Governments can implement policy and regulatory reforms to support this shift. MDBs can play a role in finding solutions at the regional level, by connecting LFIs with green finance resources, providing technical assistance, raising awareness and fostering collaboration. Germany’s KfW “Energy Efficient Construction and Refurbishment” programme provides concessional loans and grants for energy-efficient construction and refurbishment activities in the German residential sector. To qualify, projects must achieve greater efficiency than is required by the German Energy Savings Ordinance. In 2013, KfW invested €4.1 billion (US$4.5 billion) in residential retrofits. Between 2006 and 2013, it has provided more than €50 billion (US$55 billion) in loans and grants covering 3 million housing units. Domestic and international public finance can be catalytic in attracting private finance at the scale required. Deployed at the right time, at the early stages of infrastructure projects, public investment can drive the global clean energy revolution. National or subnational planning, with clearly established priorities, can be effective in guiding such investments. Another potential source of innovative or catalytic climate finance is the Green Climate Fund’s (GCF) private-sector facility. Although it has not yet disbursed any funding, it has approved eight innovative projects spanning adaptation and mitigation and engaging with a variety of partners from both the public and the private sector, and more projects are expected to be approved in the coming year.92 One example, already approved for funding, is the KawiSafi Venture Fund for East Africa, an initiative of Acumen, a non-profit impact investment organization.93 The fund will work with clean energy companies to deliver climate change mitigation, adaptation and local development benefits, starting in Rwanda and Kenya. Acumen will directly invest US$5–7 million and hopes to use seed funding from the GCF to catalyse investment to grow the fund to US$100 million. SEFFs provide financing for key types of sustainable energy projects, including energy efficiency and renewable energy; others finance resource efficiency investments that optimise water and material consumption and minimise waste. EBRD has also developed a SEFF to support investments that improve the resilience of clients’ businesses to the effects of climate change. SEFFs are accompanied by technical assistance in the form of a programme support team. This team provides expert guidance to partner financial institutions on designing financial products for green projects. In addition, the team supports partner banks with marketing and promotion, training bank staff and monitoring the development of these new business areas. The team also helps end-borrowers turn project ideas into bankable green investments. The €585 million (US$642 million) Turkey Private Sector Sustainable Energy Finance Facility (TurSEFF) provides credit lines to local financial institutions to lend to the private sector for energy efficiency and small-scale renewable energy investments. Since TurSEFF’s launch in 2010, partner banks have financed 13 landfill gas power plants for a combined amount of €15 million (US$16.5 million). Over half of the facility’s GHG reductions now derive from methane abatement in landfills. TurSEFF has also financed energy efficiency improvements in businesses, and wind, solar and hydroelectric power. Arel Cevre, for example, received a loan of €0.7 million (US$0.8 million) under TurSEFF to fund a 2.83 MW landfill gas power plant in Isparta, Turkey. The new plant is expected to produce on average 21.06 GWh of green electricity annually and has a payback period of 1.7 years. It is anticipated to generate average net revenues of €2.3 million (US$2.5 million) per year from electricity sales. The €60 million (US$66 million) Western Balkans Sustainable Energy Financing Facility (WeBSEFF) has extended credit lines to eight partner banks in the Western Balkans to lend to businesses and municipalities investing in sustainable energy projects. For example, this helped a Macedonian sweets producer obtain €970,000 (US$106,000) in EBRD financing via Ohridska Banka. The project is expected to reduce the company’s energy consumption by more than 30% and improve overall efficiency. As a result, the company expects to save €262,000 (US$287,000) per year, representing a payback period of 3.6 years. Its CO2 emissions are expected to decrease by 490 tonnes per year. Philanthropic and impact investors help bridge the gap between patient capital and venture capital, and can be transformative in scaling up sustainable energy investments, especially in low-income countries. This is where equity impact investments play a key role, especially with off-grid technologies. Not only are impact investors usually more patient with capital, but equity investments do not require collateral. In rural Kenya, Vulcan Impact Investing owns 10 solar-powered micro-grids that serve 21,000 people, operated in partnership with SteamaCo.96 Not only does this replace energy from harmful sources such as kerosene and diesel, but it also provides a sustainable energy source to drive economic activity. Several off-grid companies that started with impact investing have attracted larger-scale commercial investment, such as M-KOPA in Kenya and Mobisol in Tanzania. Through M-KOPA, nearly 400,000 customers in Western Africa have made a small deposit for a home solar system, then paid the rest of the balance back through a widely used mobile banking service based on the amount of energy they use.97 Mobisol, a Berlin-based company offering customers in low-income countries solar home systems via affordable installments made from mobile phones, has installed 50,000 solar home systems to date in households and businesses in East Africa, which have allowed its 250,000 beneficiaries to access clean, affordable energy.98 These examples confirm the role of philanthropic and impact investors as those who can help catalyse investment, not just in off-grid renewables, but in new sustainable technologies more generally. In India, where access to debt capital is generally low, off-grid companies face prohibitively high interest rates of 13–18% in the domestic market. Local banks are usually unwilling to lend to them, as the loans are too small, and international debt is also out of reach due to regulatory requirements. Therefore, most investments in off-grid energy – ranging from US$100,000 to US$5 million – have been from equity impact investors and development banks.99 Examples include Firstlight Ventures investment in Promethean Power Systems, Anthro Power and Excellent Renewable, and Ennovent’s investment in Barefoot Power. However, impact investors can find it difficult to access the Indian market, especially as they may have a hard time approval from the Reserve Bank of India to lend in the Indian market. 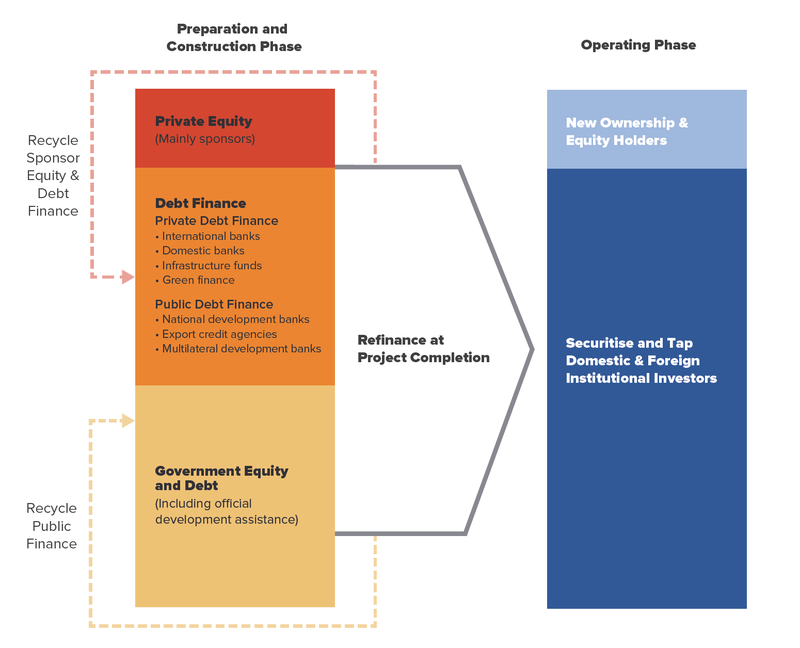 Private finance is best suited to the operational phase of sustainable infrastructure investment, but there are good opportunities to bring in private finance during project preparation and construction as well. Tailored instruments that manage the challenges of this phase, especially those related to risk-return profiles, are critical. Options include turnkey contracts, construction guarantees, targeted credit enhancements, availability payments, mezzanine financing to first-loss protection, partial risk guarantees against policy risk and exemptions from reserve requirements. Public finance can also be used to blend concessional and non-concessional finance from public and private sources for project preparation or construction. Blended finance is the strategic use of official development finance to mobilise additional public or private finance. This may be needed to finance the upfront premium for sustainable infrastructure projects and to draw in private finance and investors. DFIs can play a pivotal role here in pioneering and scaling up use of blended finance creating viable and replicable financing models. In addition to use of official finance for guarantees or insurance, syndicated loans or project bonds also provide a means for co-investing across public entities, such as local banks, NDBs or MDBs, and can also attract private investors to the early project stages. The UNDP has created a de-risking renewable energy investment methodology to reduce and, where possible, remove a range of policy, legislative, regulatory, institutional, financial, and awareness barriers that inhibit investments in sustainable energy at national and local levels. Together with technical assistance associated with financial instruments, these public de-risking instruments create favorable conditions for private sector involvement and are able to catalyze large-scale investments. Early results are promising. In Tunisia, for example, UNDP, with financing from the Global Environment Facility, is supporting de-risking measures that are predicted to leverage US$1 billion (€935 million) in private sector investment, and to significantly lower the cost of solar power for consumers. Given the increasingly commercial viability of solar technologies, it is also now possible to attract private capital on its own to eary stages of project development in some markets. Wunder Capital is an innovative example of this for small solar projects in the US. It is a financial technology company that develops and manages solar energy investment funds. There was a gap in the market for smaller project funding, as transaction costs are prohibitively high for lenders; any deal under US$2 million can cost more to prepare than the expected loan revenue. To overcome this, Wunder is structuring diversified funds that hold solar project assets, then marketing them to specific institutional investor classes, thus accessing private capital for early stages of solar projects.103 Wunder just launched a bridge fund that issues asset-backed project loans to the US solar industry and is expecting to deliver a return of up to 11%. As the minimum threshold for investment is low, there is also potential for crowdfunding with this type of business model. The generation of more certain cash flows in the operating phase opens up the prospect of replacing bank debt with bond finance that can be held by both domestic and foreign institutional investors: pension funds, insurance companies, private equity and sovereign wealth funds. This refinancing allows for a recycling of equity and bank finance that can be used for new investments (see Figure 10). In the operational phase, a key approach is securitisation of infrastructure loans once there are reliable, operating revenue streams, where the use of labelled green bonds or YieldCos provides a way to achieve this. Both green bonds and YieldCos can be used to develop infrastructure as an asset class to attract institutional investors (see discussion in Section 3). China is now a leader in the labelled green bond market – the largest country of issuance to date in 2016. It has announced it will issue US$46 billion of labelled green bonds in 2016. The BRICS New Development Bank, founded by Brazil, Russia, India, China and South Africa to finance sustainable development in emerging markets and developing countries, commenced operations in 2016. It has already made several loans; its first bond issue will be five-year yuan-denominated green bonds, and will be used to finance sustainable energy projects. Its first loans are US$300 million to Brazil, US$81 million to China, US$250 million to India and US$180 million to South Africa: all are on renewable energy.108 Future bond issuance could be in local currencies to help local investors avoid exchange rate risk. There is a role for the public sector to create and develop a market for green bonds to tap into investor demand and ensure the market meets its potential.109 To facilitate the market, common standards for green bonds should be agreed internationally. In addition to stronger and uniform standards (see Section 3), a number of factors could help to drive future growth of green bonds markets: successful implementation of the Paris Agreement, the success of green bond issues to date, tighter spreads compared to other bonds, and growing interest from emerging markets keen to grow local green bond markets.110 Green bonds could also benefit from investors’ growing desire to publicly demonstrate a commitment to the environment. There is potential as well for issuers in the US$600 billion unlabelled “green” bond market (where bond proceeds are invested in green projects but are not labelled green) to shift to issuing explicitly labelled green bonds. Integrating credit ratings and third-party “green” ratings could be a way to streamline the market and facilitate mainstreaming of green aspects in bond markets based on tools that private investors are familiar with. YieldCos, which own portfolios of low-risk, long-term projects, are equity vehicles that can go a step further than bonds by effectively bundling equity and debt together in one package. By bundling projects together, the project finance premium for single projects can be avoided or reduced. The first renewables-focused YieldCos went public in 2013, though similar funds have existed for longer; in 2015 there were 15 renewables-focused YieldCos in the US, Canada and Europe, with a total market capitalisation of well over US$20 billion.111 The solar company SunEdison has also announced plans for a YieldCo focused on projects in emerging economy markets, with an initial portfolio consisting of solar, wind and hydropower projects, among others. YieldCos and similar closed-end investment funds (the terminology varies across countries) are publicly-traded companies that own portfolios of operational renewable energy projects, paying dividends to shareholders from the projects’ revenues. Most funds aggregate solar and wind assets. Some also include hydropower, biomass and cogeneration assets. Most YieldCos have been created by renewable energy developers, selling their projects into the YieldCo upon completion. For an investor, a YieldCo or similar pooled investment vehicle can be a way to achieve the same cash flow that would come from directly owning a renewable energy project, but through a liquid, publicly traded instrument. Because these instruments are exchange-traded, they avoid some of the liquidity risk and transaction costs associated with direct clean energy investments; they therefore have the potential to open up clean energy infrastructure investments to a wider range of investors, increasing the supply and reducing the cost of capital. Investment in research, development and demonstration (RD&D) can encourage innovation, help to overcome incumbent technology advantage, and lower financial risks associated with investment in existing or new clean technology, thus reducing the upfront costs of energy infrastructure.113 Over the next 15 years, when key infrastructure systems will be built and locked in for decades, a pressing challenge is to rapidly deploy existing state-of-the-art technologies and business models or those that can rapidly be demonstrated at commercial scale, even as we also invest in next-generation technologies for the longer term. There is an urgent need to scale up RD&D investment and create a culture of innovation across the energy system. Energy-sector public RD&D is less than half what it was in the late 1970s in real terms, and still often goes to fossil fuel exploration and production.114 Previous recommendations from the Global Commission were that R&D for clean energy should be tripled to well over US$100 billion a year by the mid-2020s.115 To be effective, a scaling up of R&D spending on clean energy should be accompanied by a phase-out of public R&D spending on fossil fuels. TCPs help achieve economies of scale and promote knowledge diffusion and collaboration.119 A recent analysis using nearly 40 years of patent data from 33 OECD countries found that bringing researchers together through TCPs boosts co-invention on wind and fuel cells, and especially on biofuels, solar photovoltaics and carbon capture and storage. What kinds of environmental policies are in place can also matter. Key features include stringency, predictability as well as flexibility – that is, policies that are not prescriptive but give firms incentives to look for the best technology solutions. Bill Gates’ Breakthrough Energy Coalition, which brings together 28 major individual investors from 10 countries, with a collective net worth of more than US$350 billion, to provide capital for research on high-risk but promising clean energy technologies. The Global Innovation Lab for Climate Finance supports the identification and piloting of cutting-edge climate finance instruments that can drive investment and unlock new opportunities for renewable energy, energy efficiency, and adaptation efforts in developing countries. In just over a year of operation, it has already directed more than US$500 million to these areas in developing countries,and its model has been replicated to India with the India Innovation Lab for Green Finance. Finance for Resilience (FiRe), managed by the Climate Policy Initiative, is a platform used to crowdsource funding for ideas that accelerate finance for clean energy, low-carbon infrastructure and sustainable cities. The platform targets large-scale ideas which aim to generate investment of over US$1 billion per year. Leadership and investment from infrastructure corporations will also be essential to drive innovation, including in business models that can drive breakthroughs for rapid dissemination of new products and technologies and create new markets. Some emerging initiatives offer promise (see Box 23 below). GE’s Ecomagination is a striking example of corporate innovation in environmental sustainability. 2015 marked its 10th anniversary, with a cumulative US$17 billion in cleaner technology R&D spend that has generated US$232 billion in revenue while reducing corporate-wide GHG emissions by 12% and freshwater use by 17%. 126 The company has pledged to accelerate its actions to spend another US$10 billion in cleaner technology R&D by 2020 and achieve cumulative GHG emission and water reductions of 20%. Ecomagination now includes a range of innovative partnerships, notably with Intel, Walmart, Masdar city, Statoil, Total, the mining and oil company BHP Billiton, and the water engineering company MWH Global. Many of these partnerships focus on reducing the emissions and energy intensity of industrial operations. In the case of Walmart, the goal is commercial applications at scale, where the partnership focuses on developing and demonstrating next-generation energy efficiency, renewables and digital solutions. With results documented by an external auditor, the initiative has been more than just a research venture for clean energy and related digital technologies. Ecomagination has also helped to transform the company, setting out a vision that has helped to make it one of today’s leading green brands. Co-chaired by France and Mexico, the G20 Energy Efficiency Finance Task Group gathers 14 countries in the aim to enhance capital flows for energy efficiency investments. In 2015, it developed Energy Efficiency Investment Principles, a policy framework to catalyse private investment in energy efficiency which was welcomed by all G20 energy ministers. The Principles focus on increasing the importance of energy efficiency in energy planning, unlocking specific market barriers for the supply and demand on energy efficiency finance, and building capacity of financial institutions. In parallel, the task group coordinates a global mobilization of the financial sector led by UNEP FI and its partners with over 110 banks and investors managing close to US$4 trillion of assets having committed to further integrate energy efficiency financing in their operations through two Energy Efficiency Statements. OECD, 2016. Population Exposure to Fine Particles: Methodology and Results for OECD and G20 Countries, by Alexander Mackie, Ivan Haščič and Miguel Cárdenas Rodríguez; ENV/EPOC/WPEI(2015)5/FINAL. Analysis for GCEC, 2014. Better Growth, Better Climate showed that non-market costs, based on the value of a statistical life, can be up to 4.4% of GDP in the 15 largest economies. Bhattacharya et al., 2016. Delivering on Sustainable Infrastructure for Better Development and Better Climate.